Washing machines are an essential part of the modern household, so when they break down, it can put you in a bad position. Being unable to wash your clothes without heading to a laundromat or a friend's house is inconvenient and annoying. Fortunately, some washer problems are possible to fix on your own, provided you have some basic tools and follow a few safety procedures. In addition, some issues with odors in your washing machine can be fixed by removing the tub and cleaning it. Sears laundry machines have traditionally been sold under the brand name of Kenmore. If your Kenmore washer inner tub is stuck or malfunctioning, you might need to remove it. In addition, you might start to notice a foul odor emanating from your washing machine over time and, in turn, want to remove it for cleaning. Furthermore, if the basket has rust visible inside, you might wish to replace it. Chips in paint or jagged cuts in the metal can also damage your clothes. To remove a Kenmore washing machine tub, you will first want to follow a few safety procedures. Turn the power off to the washing machine at the circuit breaker, then unplug it from the wall. Turn the water off at the washing machine source to ensure it does not flood the area if you accidentally dislodge the hose during your work. You should wear heavy-duty gloves while you're working because you may find that the washer has sharp edges that could cut your hands. Tape the lid of the machine shut so that it doesn't come open while you are working. Get assistance in pulling the washer away from the wall. Then, remove the screws from the control console on the back of the washing machine so that the wire cover can be removed completely. Next, lift the top panel from the machine. This isn't done by pulling straight up. Instead, slide it forward by about a ½ inch, then raise the panel by a ¼ inch. While it is raised, push the panel back by a ¼ inch so that it releases from the brackets. Once you've been able to dislodge the top panel, lean it against a wall behind the washer so that you have access to the tub. Use a screwdriver to pull the bottom of the tub ring and release it from the side of the outer plastic wash tub. Next, pull the tub ring out of the washer. Use a screwdriver to pry the cap off the impeller, and then use a socket wrench to remove the bolt that holds the impeller in place. Once you remove the spanner nut, you should be able to take the washer tub out of the washer. If you're removing the tub so that it can be cleaned, wash it thoroughly and let it dry before you reassemble. If you'll be replacing the tub, ensure you have the correct size and model and install the new tub as per manufacturer instructions. Once you've replaced the tub and reassembled the washer, turn the water back on and restore power to the machine. 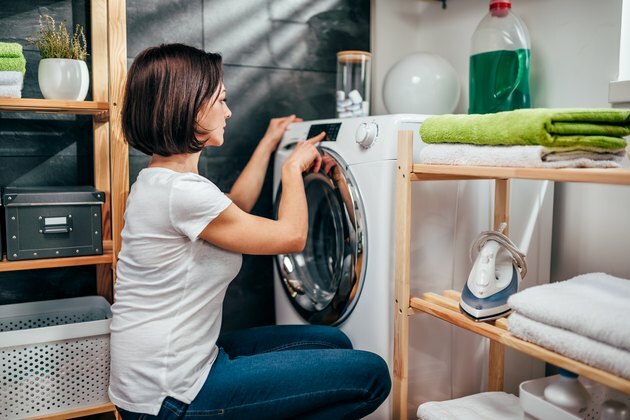 Note that if you have another brand or style of washer, the strategy for remove the tub may be different. For instance, if your Maytag Bravos tub is stuck, you could need to apply extra strength to the tub ring during removal. This part is notorious for being problematic in the washer. Additionally, removing the tub from a front-loading washer may differ from a top-loading one, so be sure to consult manufacturer instructions before proceeding.